In ONTRAPORT Pages, order forms are made up of various elements. Credit card, billing address, submit buttons etc. are all found under the "Form and Sales" section in the elements palette. Let's create an order form! One of the great values in ONTRAPORT Pages are the pre-built and fully customizable page templates. We will use a sales page template and adapt the order form. Let's walk through the steps needed to get your order form up and working in minutes! Click "+New Landing Page", click "View by Type" and select "Sales Pages". For this example we'll use the Pages template named "Marketing, Memes and More"
Click onto each Text element to edit text. In the Order Summary element, click on + Add/Edit Product and select your product. It's import that you spend a few minutes setting up your Form Settings and Payment Settings. Click on the Submit Button and select the Form Settings icon at the bottom of the palette. Single Opt-In is recommended, and it will already be selected. If you don't already have a Thank You page created, click the "Use this Landing Page" drop down and select Create New Landing Page. When you save that page you will be returned to this page. Click Save at the bottom of the form settings. There are other settings, but in most cases you won't use them. 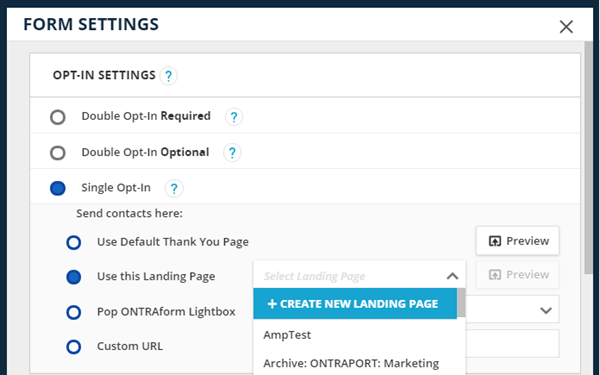 We recommend just using Single Opt-In and setting a thank you page, and then saving the settings for almost all your opt in forms on ONTRAPORT Pages. Access your Payment settings by clicking on "Edit Block" and selecting "Payment Settings" from the Palette. You'll notice that you can edit your product here as well. Note: Be sure and select your Payment Gateway. Name it and Save it as a Favorite! Easily pull this Order Form up on another ONTRAPORT Page via the Favorites Menu. Favorites function similarly to templates, cutting down on the time needed to create. Now your order form block is ready to go to work for you. Happy Selling! For more details on the using Form and Sales Elements, we recommend taking a look at this article.